Remember the Bentley Meteor featured on Top Gear a few series back? It was recently featured on Jay Leno's Garage too. A huge, gurgling 27 litre V12 (sans supercharger) clad in a body that harks directly back to the early 20th century. Putting an engine of this enormity into a vehicle is plainly ridiculous. It's a fantasy car, a dream. Except it isn't - you can, at great expense, purchase and have one built from Petersen Engineering. That'll be £500,000 please. 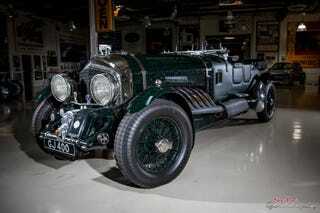 Imagine this: a replica Chitty with that glorious V12 wrapped in chrome, wood and nostalgia. On the back, that wicker picnic basket becomes the huge new fuel tank. That beautiful, boat inspired cabin will still be quilted in red leather. Underneath, strong modern mechanicals translate the huge power into movement. Big contemporary disc brakes all round help ease the huge vehicle to a halt. Modern cooling systems keeps the temperature in check. Everything would have to be beefed up. It's probably likely that a replica Chitty with that Meteor V12 would be even bigger than the original. But to be honest, that's no big deal, the original Chitty was at least 18 feet long. The bigger it is, the more presence it will have!